Archaeologists are notoriously nervous of attributing ritual significance to anything (the old joke used to be that if you found an artefact and couldn’t identify it, it had to have ritual significance), yet they still like to do so whenever possible. I used to work on a site in the mid-1980s – a hill fort in Gloucestershire – where items of potential religious note occasionally turned up (a horse skull buried at the entrance, for example) and this was always cause for some excitement, and also some gnashing of teeth at the prospect of other people who weren’t archaeologists getting excited about it (“And now I suppose we’ll have druids turning up”). The Brodgar complex has, however, got everyone excited. It ticks all the boxes that make archaeologists, other academics, lay historians and pagans jump up and down. Its age is significant: it’s around 800 years older than Stonehenge (although lately, having had to do some research into ancient Britain, I’ve been exercised by just how widely dates for sites vary, so perhaps some caution is called for). Pottery found at Stonehenge apparently originated in Orkney, or was modelled on pottery that did. The site at the Ness of Brodgar – a narrow strip of land between the existing Stone Age sites of Maeshowe and the Ring of Brodgar – is massive: the size of five football pitches and circled by a 10ft wall. Only a small percentage of it has been investigated; it is being called a “temple complex”, and researchers seem to think that it is a passage complex – for instance, one in which bones are carried through and successively stripped (there is a firepit across one of the doors, and various entrances, plus alcoves like those in a passage grave, which are being regarded as evidence for this theory – but it’s a bit tenuous at present). Obviously, at this relatively early stage, it’s difficult for either professional archaeologists or their followers to formulate too many firm theories. When it comes to the pagan community, I don’t think that its sounder members will be leaping to too many conclusions too soon; as discussed in a previous column, some of us would prefer to rely on the actual evidence rather than rushing off at a tangent. I cannot help wondering whether the relatively muted response across the pagan scene to the Brodgar findings has to do with the fact that the central artefact discovered so far – the “Brodgar Boy” – is apparently male rather than female. I am cynical enough to wonder whether, if it had been a northern Venus, there would be much more in the way of rash speculation about ancient matriarchies. 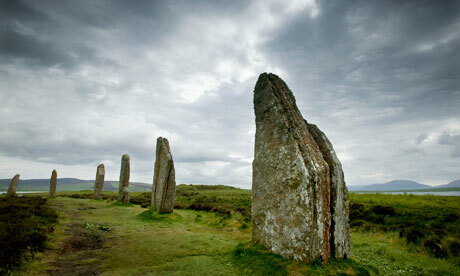 Will we see the pagan community flocking to Orkney at the solstices? I doubt it. Orkney is a long way off and rather difficult to get to, whereas Stonehenge and Avebury are with a reasonably easy drive if you happen to live in the south of the country. In the days when the site was at its peak, most traffic would have been coastal, and remained so for hundreds of years to come. 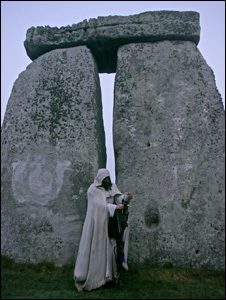 (And to be fair, many modern pagans aren’t actually too keen on trampling over ancient sites, sacred or otherwise, due to awareness of their relative fragility). With regard to the “boy” himself, and other ancient representations of the human form, we simply don’t know why people made them. Maybe they are gods, goddesses, spirits. Maybe they’re toys, or lampoons of particular individuals, or just someone doing some carving in an idle moment. It’s hardly a startling theory that, throughout history, people have made stuff for fun: I’ve always been very amused by Aztec pots made in the shape of comical animals, looking for all the world like the early precursor to Disney and somewhat at variance with the sombre bloodiness of other aspects of that culture. As soon as the Bronze Age arrived, Brodgar was completely abandoned. There was apparently a mass slaughter of cattle, which would have fed as many as 20,000 people on the site; this is being taken by some experts as evidence of a complete and sudden cultural replacement. But whether it has ritual significance or not, the sheer size, age and numbers involved with the Orkney site make it of immense importance to the history of ancient Britain. These henge monuments have been, and still are a mystery to archaeologists and all interested in them. Stonehenge being the most popular at the moment,but it cannot be stated for ceretain what it was used for.Maybe one day in the future, one of these monuments will give up its secrets and put our minds at rest.